In general terms, the Romans coined the name 'Gaul' to describe the Celtic tribes of what is now central, northern and eastern France. The Gauls were divided from the Belgae to the north by the Marne and the Seine, and from the Aquitani to the south by the River Garonne, and they also extended into Switzerland, northern Italy, and along the Danube. By the middle of the first century BC, there was a cluster of smaller tribes in the Alpine region of western Switzerland and the French/Italian border. This included the Ceutrones, who were located in the Alps, on the very eastern edge of the later Gallia Narbonensis province. They were neighboured to the north by the Medulli, to the south by the Segusini, and to the west by the Allobroges. The tribe's name is not necessarily too obvious in its meaning. Removing the suffixes leaves 'kentr-' (singular, 'centros'), which is a thorn or a cockerel's spur. This could be a metaphor for the points of the warriors' spears. The '-on' and '-es' are the usual Celtic and Latin suffixes. 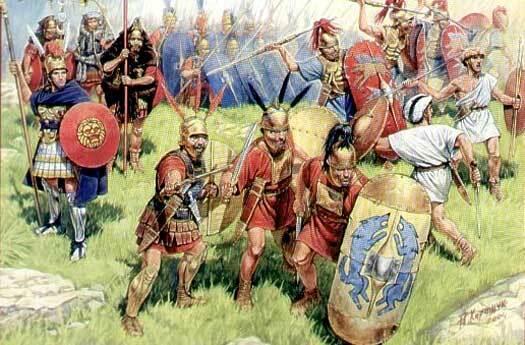 Did the tribe fight in a spear phalanx, a tactic perhaps picked up from Celtic contact with the Greeks? The Forum Claudii Ceutronum is even now still called Centrum, and shows the tribe's actual name rather than the flippant Roman mispronunciation. So Centrones is most likely the correct form. The tribe should not be confused with the Centrones of Belgae, who were a constituent of the Nervii. The Alpine Centrones lived in the Vallée de la Tarentaise, in what is now the Savoy region of eastern France. The valley is home to the River Isère in the French Alps, having gained its name from the tribe's chief settlement at Darantasia. In winter it is effectively blocked at the upper end by snowfall. Although the settlement's name survived in use for the valley, it did not survive for the town itself. It seems that in later Roman times it was still known as Darantasia (as shown on the Tabula Peutingeriana map which is thought to be fifth century), but perhaps also as Tarentaise, a simple modification of the Celtic name. This fell out of use, with the town apparently being so much dominated by ecclesiastical matters that by 996 it was called Monasterium, indicating the presence of a monastery. This became Moustiers and is now Moûtiers. Ptolemy places the tribe in the Graian Alps, west of the Aosta Valley and also west of the Salassi. Roughly speaking, this does not necessarily alter their position in the Tarentaise Valley. There is also a village called Centron in Montgirod, Savoy, which preserves the tribe's name. Despite the death of Orgetorix, the Helvetii decide to go ahead with their planned exodus. Julius Caesar cannot put up with the idea of having such a dangerous force of Celts occupying the more peaceful plains of Gaul, so he force-marches two new legions from Italy to face the threat, although the Ceutrones, Graioceli, and Caturiges attempt to block his passage through the Alps. As he passes through the territory of the Vocontii to enter that of the Allobroges and then the Segusiavi, groups from several local tribes are joining the Helvetii, including the Latobrigi, Raurici, and Tulingi, making them one of the largest and most powerful forces in all of Gaul. Unfortunately, the Battle of Bibracte between Celts and Romans is a total victory for the latter. The Helvetii are mercilessly crushed and are forced back to their homeland. This act sets in motion a train of events that results in the eventual annexation of all of Gaul into the Roman state. Augustus determines that the Alpine tribes need to be pacified in order to end their warlike behaviour, alternately attacking or extracting money from Romans who pass through the region, even when they have armies in tow. He wages a steady, determined campaign against them, and in a period of ten years he 'pacifies the Alps all the way from the Adriatic to the Tyrrhenian seas' (written by Augustus himself). Emperor Augustus creates the province of Alpes Maritimae (the maritime, or seaward, Alps). It has its capital at Cemenelum (modern Nice, although this is switched in 297 to Civitas Ebrodunensium, modern Embrun). The history of the Alpine region's population of Celts is now tied to that of the empire.